Versatility and style are just tips of the iceberg when talking about the features of the Wireless Newtral Mouse by Goldtouch. Go below the surface and you'll also find supreme customizability via the swappable grip attachments, letting users of all sizes find their most comfortable grip. 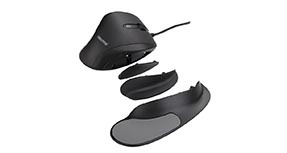 Personalizing the mousing experience is easy with the Goldtouch Newtral Mouse - Wireless version. For a work-altering way to add optimal ergonomics to your work style, adjust your mouse and feel the difference. 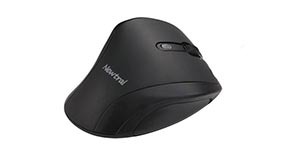 The Goldtouch Newtral Mouse is available in either a Medium or Large size. Combined with the grip attachments and programmable buttons, the size option allows for an even more customized grip for optimal performance. $65.00 List Price: $75.00* The list price is the same as the MSRP (Manufacturer's Suggested Retail Price). It may not necessarily be the price at which the product is sold.